With today’s successful breeding strategies, rarely are Black Ocellaris taken from the wild. Our blacks have been selectively bred for excellent color. 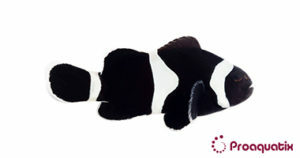 We strive to deliver nearly all black fish with white barring. There is always some variation among individuals, but no more than slight orange on the face (which will darken with time).